As mentioned in my last post, with an aim to analyse the marketing emailers that I’ve received, I let promotional emails accumulate in my Gmail folders for over three months – from June to August this year. Presented in this post is an analysis of these emailers, an experiment I’m glad to share with the readers of this blog. I almost never notice ‘marketing / promotion / lead generation’ emails sent to me. That’s because Gmail, my primary email client for personal emails, detects and filters unwanted emails with an alarming accuracy level – less than 0.1% of email in the average Gmail inbox is spam. And the occasional, unsolicited ones that I do spot in my inbox are duly marked ‘spam’ which ensures that I don’t see more such in future. As I downloaded the emails accumulated in my spam folder, I noticed that more than 90% of those emails were for Banking and Financial services (BFSI) products. It was a significant volume of emails from one sector, so I removed the small number of emails from other sectors and am just presenting the findings from the 469 emails from the BFSI sector. Hence, a caveat, this is a biased analysis. The analysis is only of BFSI product emails sent to me specifically, based on how I have been profiled by a) email marketing service providers / databases (ESP), and b) BFSI products/brands that I purchased or interacted with; as well as c) a few ‘opt-out’ choices I made over the course of these 3 months from some of the email databases. Did you notice that I mentioned that these emails were pulled out from the spam folder? A probable reason for emails from these senders being classified spam is their domain / IP reputation, not to mention the ‘quality’ of their email lists. The graph below shows the top email sending domains and the number of brands they’ve sent emails for. For instance, I received 65 emails, on behalf of 15 different brands, from one of these senders, mailpost.in. These domains are pretty much in the business of ‘bulk’ mailing – repeatedly sending emails to the same consumer for various brands. Would a brand really want to be associated with such bulk senders? As marketers, before picking or approving an ESP, some hard questions need to be asked. How was their database built? How good is their segmentation? What data protection systems and processes do they have? What is their spam rate? How do they measure deliverability? What tools do they use for email authentication? What is the domain and IP reputation? Digging deep into these even before an email is designed ensures tremendous campaign success later. As I opened these emails to glance at the contents, the quantum of such email kept increasing and this trend continued even after I stopped opening them and unsubscribed to some of these databases. From about 2.6 emails every day in June, they went up 3x to 8.2 emails per day by August. The one thing that ESPs are clearly good at is tracking open rates and ensuring their future mailing tactics maximise chances of meeting their objectives. The next variable I looked at was day of the week. BFSI brands prefer weekdays, with a slight peak in emails sent on Thursdays and Fridays, and a clear drop on Sundays. At an hourly level, the trend is clear too; email receiving peaks between 11AM to 1PM. I got 40% of all emails in that slot and this trend was fairly consistent across weekdays and across months. These trends are in-line with some send time learning on email marketing. 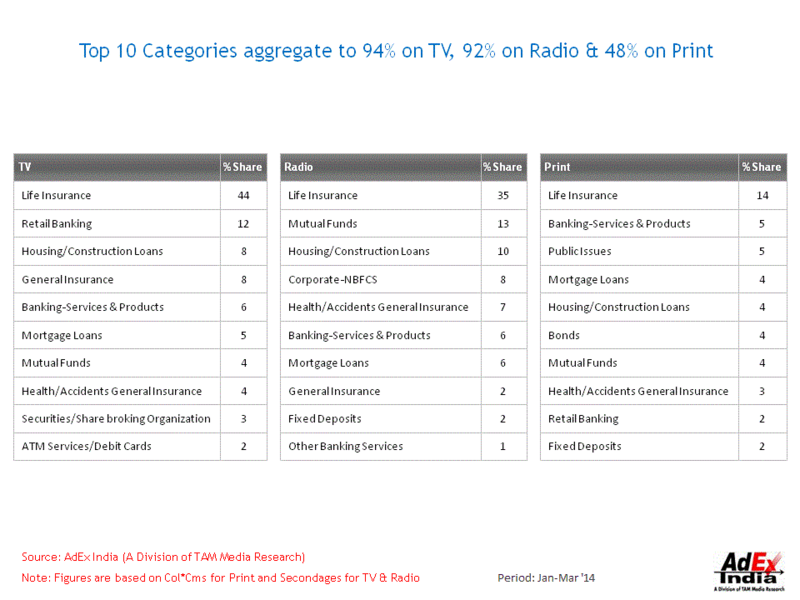 Among the various sub-segments that comprise BFSI, Life insurance has the maximum share of voice (SOV) on mass media (TV, print and radio). It’s followed by Mutual Funds and Retail banking (thanks to all the new banking licenses), and I expected the same aggressiveness and SOV in digital/email marketing as well. But, more than a third of emails I received were for Credit cards followed by those for Personal loans. The former are being pushed aggressively by traditional banks while the later were being pushed by NBFCs. Banks still send 44% of all emails. But what is really interesting is that if you remove credit cards, both NBFCs and online aggregators/dotcoms are giving tough competition to traditional banks. Online aggregators have started to go beyond regular insurance products and are sending out a fair mix of emails on other financial products. In terms of the actual emails themselves, to see how many different ‘creatives’ are being sent, I analysed the subject lines. I began by assuming that the email content / message is the same if a subject line is the same; many a time the email content was the same even with a changed subject line, I ignored this scenario. I noticed that both the quantum of duplicate emails as well as their proportion kept increasing as months went by. While this is a telling commentary on how an email marketing companies’ business model works; what is of greater concern is that brand marketers are opting to re-send the same set of creatives for months together. As mentioned in my earlier blog post, the email subject line has a critical role to play in email marketing. It has to provoke and interest a person enough to make him open and read the email body. And because email open rates are abysmally low, the subject line has an additional burden of delivering the brands’ benefit. The word cloud shown below visualises the words used in the subject lines in these 469 emails that I received over the 3 month period, with the brand and product category names removed. The more prominent the word, the more frequently it is used in the subject line. Once the brand name and product category is established, brands seem to be mostly communicating promotions – free, no fee, save, cash back, complementary, vouchers / tickets, offer etc. Very few talk about other important benefits that drive brand image, such as a) service levels – expert, stress free etc., b) process – instant, e-approved, cashless etc., and c) network – large, convenience, etc. The basic selling of almost all products on discounts and rewards is quite telling, it probably indicates one of these – heavy competition in this space, current stage of category evolution and/or undifferentiated benefits. Coming to the content of the emails, what I received was an overdose of image-based emails. Most email clients suppress images by default; this not only leads to wrong measurement of ‘open rates’ but also a bad user experience as a consumer doesn’t seeing anything immediately on opening an email. The other problem with image-based emails is that they leave little scope for personalization basis name or even basis segmentation and profiling of consumers. Then there is content that seems to follows a standard template, what I call ‘the bullet point’ approach’. These mailers typically have 4-5 undifferentiated features listed, stone-cold, without a mention of the overarching final payoff in terms of what it gives the consumer (functional benefit) or how it makes them feel (emotional benefit). The functional benefit, even if attempted, is just a description of what the service does (e.g. quick financial assistance for all your needs), it does not ladder it up higher to how it improves the customer’s life (So what ? How does this matter to me? How will it make my life better?). In many cases, the heading is another feature or a call to action and neither it nor the image add any value to the subject of the email. The reason why someone opened an email is because they are interested in knowing more about what is promised in the ‘subject’ line. When an email message doesn’t deliver or explain what the subject line promises, the click-through rates plummet. Then there were some mailers that made the unpardonable mistake of having multiple call-to-action (CTA) or worse still not having a CTA. While the image itself is clickable, how is the consumer to know what action is required from him / her to get to what is being promised? The typical CRM emails wishing customers on various occasions (festival, celebration etc.) fall into this category too. It’s critical to balance value and frequency and avoid over-sending emails. Analysing the emails from the past few months, I get a sense that marketing teams often completely outsource email marketing to generalist agencies and ESPs, spending very little time and effort monitoring and reviewing email marketing strategy and campaigns. This essentially means most email marketing programs fail to deliver on their objectives, or even if they do, they deliver them sub-optimally. Email marketing is by no means easy and it has many moving parts that the brand has to get right – strategy, technology, creative (design, copywriting) to robust analytics. Here’s hoping to see a few email campaigns in the near future that are pathbreaking.